Nick Racing Stars. Ladies and gentlemen start your engines and get ready to race around the tracks with some of your favorite Nickelodeon characters. Compete in races to unlock new characters. Play quick race or Grand Prix. 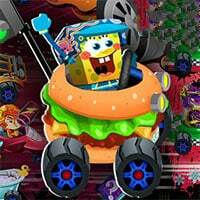 Nick Racing-Stars is a game by Nickelodeon featuring Spongebob, TMNT, and many more of their famous TV shows stars. This game is one of the racing games on Round Games. Enjoy and have fun in playing this free online game. Good luck. You may also enjoy playing Greyhound Racing Game, that we picked up for you from our racing games. Nick Racing Stars is a free online racing game on Round Games.